Leading Manufacturer of wet back boiler, 3 pass wet back oil fired boiler, 3 pass wet back boiler, 3 pass wet back boiler (manual fired) and fully wet back boiler from Ahmedabad. Our offered Wet Back Boiler that comes with a reversal chamber that is completely surrounded by water, which is used to direct flow gasses from the furnace to the tube banks. The surrounding water absorbs burner heat, helping improve operating efficiency as heat from combustion goes directly into evenly heating water instead of refractory. The wet back boiler design uses separate tube sheets between tube passes which can be more forgiving with load changes. 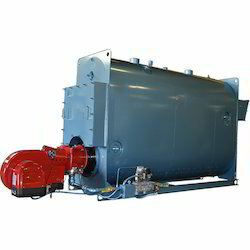 Our organization is involved in providing fine quality 3 Pass Wet Back Oil Fired Boilers in the market. Our 3 Pass Wet Back Oil Fired Package Boilers are appreciated by the clients for their high quality standards. Our range of vertical coil boilers is capable of generating instant steam within 4 to 5 minutes from a cold start. Equipped with control circuit logic that ensures that the boiler is going to lock out safety in case of any abnormal operating condition. We are one of the major manufacturers and exporters of optimum quality Package Boilers in the market. These 3 Pass Wet Back Oil Fired Boilers have robust welded construction and designed in accordance with the international standards. Here all welding seams are 100% radio graphed to ensure high durability and longer life. It is also provided with hinged doors at front and rear at the ends to give easy access for inspection, cleaning and replacement of tubes. 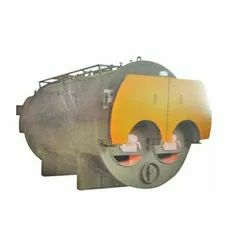 Our organization is counted as a prominent manufacturers and exporters of 3 Pass Wet Back Boiler (Manual Fired) in the market. 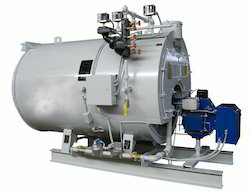 Its unique design allows optimum heat transfer for steam to fuel ratio consumption with no maintenance making it cost effective. Ample space in wrapper shell permits quick & easy transfer of flue gas in each pass with uniform temperature on every tube plate that eliminates the fear of premature tube failure and cracks in the tube sheet. We offer a wide range of Fully Wet Back Boiler. Keeping in sync with time, we are able to offer Package IBR Boiler-3 Pass Wet Back. The offered range is available in various capacities and allied specifications so as to cater to the diverse requirements of clients. Along with this, the offered range is widely appreciated for its durability, performance, superior finish standards and reliable operations.